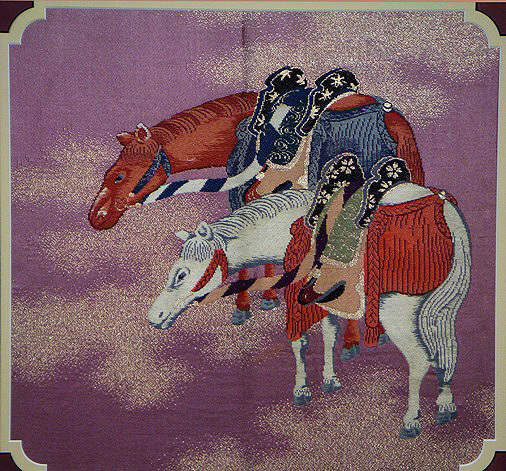 These elaborately caparisoned horses (“Uma”) were the dominant feature of a Woman’s Nagoya Obi. 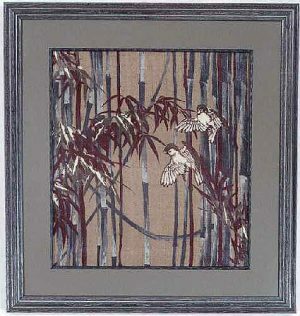 At first glance, they appear to be magnificently embroidered on a very rich, heavy, Satin Silk. In reality, however, this elaborately woven piece is an example of the difficult art of “finger weaving,” which makes the piece appear to be embroidered; when, in reality, the design is part of the weaving from the beginning. This weave is also referred to as “Tsuzure-Ori” or Tapestry weave. The weaver’s fingernails are basic tools, used along with a wooden comb, with which he beats down the weft of the tapestry. Each nail has a shelf cut in it, which makes it resemble a step ladder…each step holding a different color of silk thread. 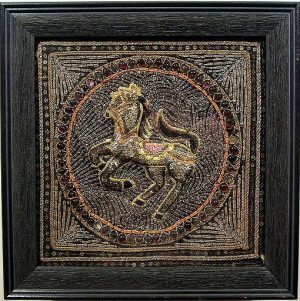 This was what enabled the weaver to create free-form designs; and, also, made it possible for the weaver to add the pure gold threads which create the cloud pattern surrounding the horses. 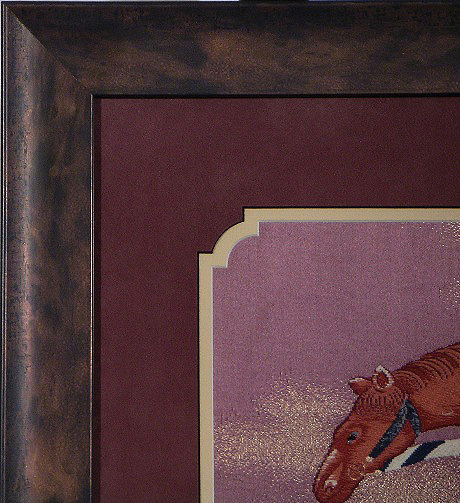 In this way, rare and sumptuous designs were created for the upper classes. 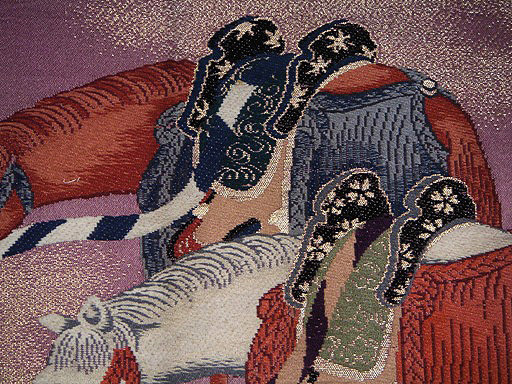 The use of horses as the main motif on this Obi demonstrated that it belonged to a woman of the nobility. Horses were limited to the upper class, and it became one’s heavenly duty to ride a horse when one visited a Shinto Shrine. In addition, horses were often given as a prayer offering to shrines. The wealthy gave meticulously groomed, and luxuriously and decoratively trapped horse as gifts, while the poorer gave paintings of horses on wood (“Ema”). These can still be seen as valued works of art at many shrines in Japan today, while the famous Nikko Shrine still maintains its white horses. A white or a black horse was most often used to lead the Shrine’s processions, and was believed to bring or end rainfall. Only natural dyes were used throughout, while the purple background was only used by members of the Imperial Family. Thus, the woman who wore this Obi would have been of high social standing as well as quite wealthy, as indicted by the heavy use of pure gold threads. Hand woven heavy Satin Silk with finger weaving and pure gold threads. 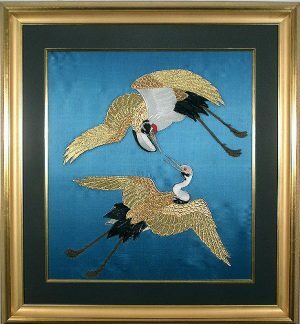 Finger Weaving is an age-old art in Japan, wherein the weaver used “slots” cut in his fingernails to control the numerous additional threads required to weave such a dimensional tapestry. 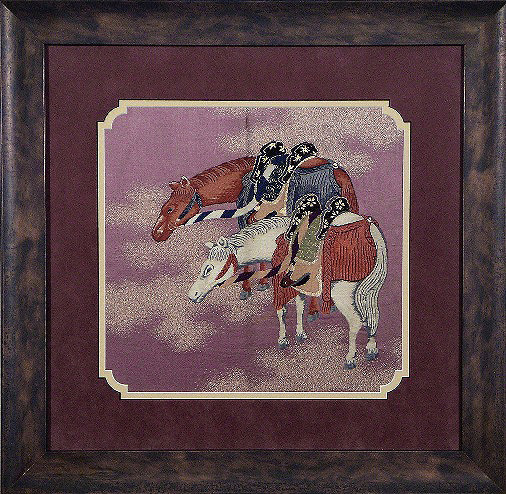 These richly adorned horses have been set in a black-core, purple suede mat laid over an acid-free light cream mat. 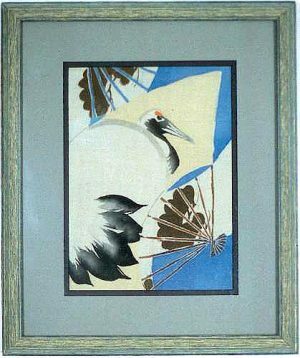 Both have been cut with the Japanese “Kobe” corners, and then enclosed in a mottled wood frame that echoes the colors of the Textile Artwork. It is protected by 97% UV protected glass. This marvelously ornamental Obi has been mounted in conformance with the highest standards in order to ensure a damage-free environment for its future protection.